Athletic Greens Superfood Cocktail powder has a naturally sweet taste and took over ten years of research to develop an easy to mix powder that makes it ideal for green health shakes. Health Nutrition News has a new video review out on Athletic Greens Superfood Cocktail and the benefits it provides to people looking for both a quicker, healthier breakfast alternative and individuals who want a better tasting green smoothie. They understand that most people who try to mix their own superfood cocktails just combine every green vegetable and various fruits. This often leads to people creating expensive and disgusting smoothies that ultimately get thrown out. When people have this experience their first time trying this drink they are often tentative to give it another chance and this prevents them from getting the healthy benefits associated with green superfoods. HealthNutritionNews.org points out that when enjoyed properly green superfood shakes are healing, loaded with nutrients, contribute to increased energy, and are a quick alternative to breakfast. 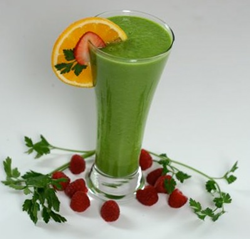 It has also been found that green smoothies can aid with digestion, support weight loss, and work as an immunity booster. Unfortunately, it can be difficult and expensive for people to keep fresh fruits and vegetables in stock at all times so there are now many superfood powders available to mix easily into a cocktail. One in particular is becoming increasingly popular and is loaded with twelve serving of fruits and vegetables in each tablespoon. Athletic Greens not only provides many health benefits but also it has been recommended by nutritionist and world record holder Cliff Harvey as well as Beyond Diet’s Isabel De Los Rios. Health Nutrition News spotlights some additional benefits that include seventy-five different whole food sourced ingredients, probiotics, and enzymes for optimal nutrient absorption. These ingredients also help to naturally increase energy and provide the body with critical vitamins, minerals, and enzymes needed to protect its immunity. To listen to more of the benefits provided by Athletic Greens check out Isabel De Los Rios in her recent video. Health Nutrition News recommends Athletic Greens for both people looking for a great tasting green smoothie and also for anyone looking to support their overall health. Anyone looking for more information on Athletic Greens or where they can purchase it can check out their website at https://www.athleticgreens.com/.